Would you like to enjoy the city like a resident? Then leave your luggage in one of the most suggestive areas of its historic center: the ancient island on the Adige River. Begin your journey here, discovering decorative motifs and period details that speak of the city’s history. At breakfast, let yourself be seduced by local delights that reflect the region’s traditions and the changing seasons. If you want to hear old stories about the city or have insights about food traditions and hidden gems that only a lifelong resident can provide, just ask! My house is located in the city center, in a building from the early Twentieth Century on Piazza Isolo. In front of the house is the Santa Maria in Organo Church against the Torricelle, the hills of Verona. You can reach all of the major monuments and points of interest on foot (Juliet’s house 500 metres, Piazza Erbe 700 metres, Roman theatre 400 metres). If you come by train or airplane, the bus that connects them to the historic center will let you off right in front of the house. If you come by car, you can park right on the street or in a parking area next to the house. If you prefer covered parking, there is a paid parking garage located right in front of the building. If you are a bicycle enthusiast, Piazza Isolo offers a Verona City Bike Sharing service station. The 2 double bedrooms and one single room are comfortable and quiet, with decorated floors that date back to the early 1900’s. From the double rooms you will enjoy the view of the Torricelle, the hills of Verona, the city walls and the beautiful church, Santa Maria in Organo. The bed have Valsecchi latex mattresses and natural fiber sheets. The private bathroom, located in front of the rooms in a private area, is spot cleaned every day and provided with wc and bath/shower. Besides the pictures, how can I be sure that the size of the room, hygienic standards and systems safety are adequate? In my house your wellbeing and safety are guaranteed by the fact that Le Flaneur is a licensed bed and breakfast. Local authorithies conducted an inspection and certified that the size of the rooms is appropriate (actually even larger than requested). They also verified that hygiene and healthiness requirements are fulfilled, that systems comply with national standards and provided services are adequate. What if I should need any information or if encounter a problem during my stay? I live in the apartment, as required by the regulations of the Veneto Region, in separate area. You will enjoy absolute privacy but, at the same time, you will always be able to turn on me for any information or help during your vacation. You will be given the keys to the front door to allow you total freedom but you will be never left alone. I know that, as a tourist, I am required to pay a tourist tax. How do I pay for it? Please respect the rooms and do not disturb others in the building with loud noises. Smoking is not allowed in the house and only registered guests are permitted. I generally do the check in starting from 2pm but, if you are arriving in town in the morning, I can arrange an earlier check-in so that you can drop your luggage. Check out is by 10 am. I kindly ask you to stick to these times in order to allow me to organize your stay and my personal life at the best. I am not able to host pets as I have a cat living in the house. The cat lives in my private area of the apartment and is not allowed to access the bed and breakfast area. I'm your hostess, Veronica. Opening my house to guests from other countries comes very natural to me because I have always been attracted by different cultures. I recently fulfilled my dream of dedicating myself to tourist hospitality by opening Le Flaneur Bed and Breakfast. Now I work full time at Le Flaneur and I am involved in the organization of Bologna’s Smell Festival ( The latter lets me dedicate time to my love for the world of perfumes and aromas. ​ ﻿I look forward to showing you the beauty of my hometown, to offering you a comfortable stay and, if you like, to unveiling some of its lesser-known treasures. We stayed in Verona for two nights. Veronica was a tremendous host. She made sure we knew how to get around and the best places for authentic cusine. The room was charming, comfortable, and conveniently located for exploring by foot or bus. We loved Verona and appreciated everything Veronica did to help us have a memorable trip. Dear Jessica thank you for taking the time to write your wonderful review! It is fantastic to learn that you loved my insider tips ;) the charm of my house and the location, just a few steps from all the main sights. You were amazing guests and it was a real pleasure to have you at my place. I hope to welcome you back soon! Veronica's space in Verona is exceptional! Veronica's B&B is elegant, special, stylish and exceptional. This is one of the best places we've stayed on our travels. The attention to detail in furnishes and finishes as well as the personal attention was remarkable. We will come back to Verona just to stay with Veronica and have the beautiful view over the hills and lovely breakfast. Thanks so much much for putting the top on our Italian trip. 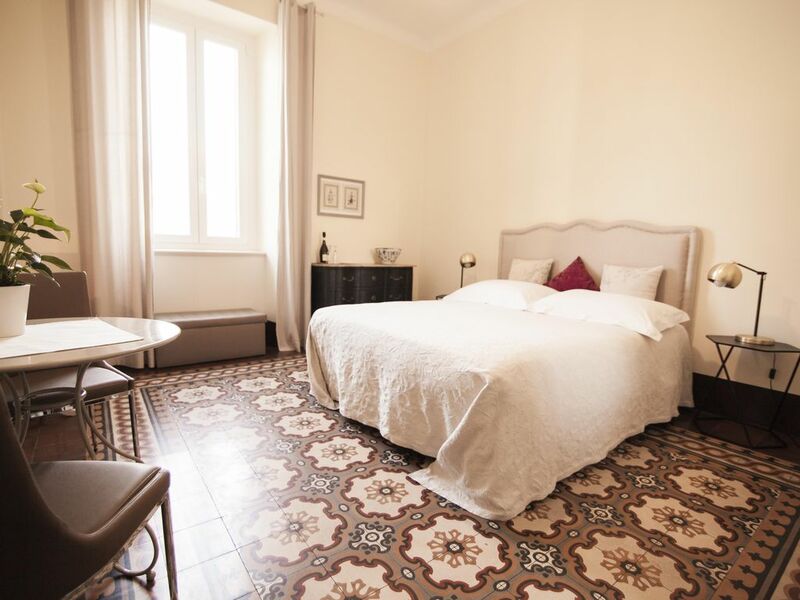 Le Flaneur is set in a 19th Century building located near Juliette's House, Piazza Erbe, and Ponte Pietra. The Veronetta neighborhood where my home is located has conserved its authenticity, compared to other parts of the city. It is lively and intellectually stimulating, thanks to its vicinity to the University. Every day new local small businesses pop-up: clothing and vintage furniture shops, galleries, ice-cream shops specializing in Italian gelato and handmade chocolates.